Basic u-boot and kernel works. The LVDS panel works if a clock is added in fex file. Touch chip (focaltech ft0402) is initialized and i2c irq seems to work, but no valid data is present. With evtest garbage data appears when touching screen, but no valid coordinates. For building u-boot, use the "K1001L1C" target. The back button triggers FEL mode. Remove the 2 screws on the connector side. The screen edge extends beyond the connectors, and with the device lying on its display, gently push the outer rim out with your plastic tool. You will soon hear the clamps pop. 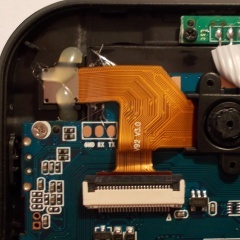 There are clearly labeled pads, on the top left edge, near the camera, you just need to solder on some wires. For more info, refer to the UART howto. The motherboard is named Inet K100, and the variant shown here is a K100-C (from the sticker on the top of the board). Yones Toptech BD1078: same case, different board. This page was last modified on 12 May 2016, at 19:36.